– Corporate media seemed not to be noticing it. – Climate change and inter-connected ecological degradation are the biggest threat to society and quite possibly life on earth. – We had a hunch this was going to be a radically important story. As we approach the crucial date of 15th April 2019, and the planned shutdown of major cities all over the world, we’re collating our short history of the Rebellion here, so keep checking back as the story unfolds. 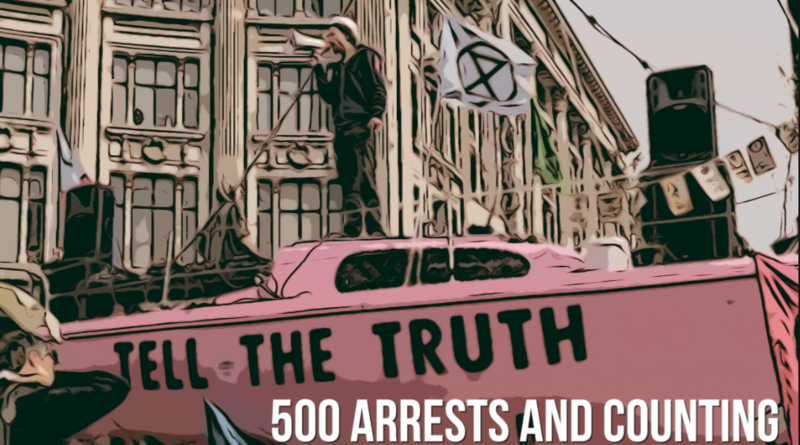 Real Media began following the work of one of Extinction Rebellion founders, Roger Hallam, since he helped create the UCL Rent Strike campaign back in August 2016. The student strike won big concessions from the university including a multi-million slush fund to help students struggling on low incomes. Roger is an organic farmer in rural Wales whose successful business was all but wiped out by successive years of freak weather patterns, at which point he realised someone needed to do something about climate change. So he went to university (Kings College London) to research a PhD on radical mobilisation, with a modest plan to create a global rebellion and stave off a sixth mass extinction on this planet! 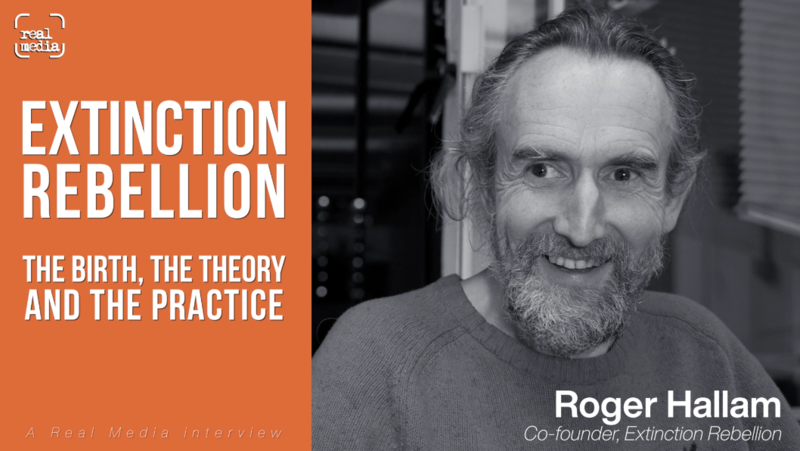 Honing his research findings in practical tests, he helped organise and mobilise workers in sectors where unionisation was previously almost non-existent, advising two new grassroots unions – the International Workers of Great Britain and United Voices of the World – which have made great inroads into organising and winning important victories for couriers, Deliveroo drivers, cleaners, security guards, and many other workers caught in precarity. He also turned his research on his own academic institution, where in a bold campaign which included arrests, hunger strikes and criminal damage, he won a commitment in just 6 weeks that Kings College would divest fully from fossil fuels – something which campaign groups had been unsuccessfully trying to achieve for many years. While continuing to organise campaigns, including the Stop Killing Londoners air pollution protests and the anti airport expansion Vote No Heathrow campaign, he was also networking and planning for his big goal, finding common ground with the RisingUp! network, and creating Extinction Rebellion. We filmed one of his very first recruitment lectures back in April last year. Some of the climate science mentioned has since been updated, but the main message – “We’re f**ked” – is clearer every day. The main point of the lecture was to explain how serious the issue is and then offer a plan for how people can organise to combat the inertial impotence of our leaders and the greed-motivated blindness of our corporations. On August 31st a tiny roadblock at Trafalgar Square in central London marked the historic first public action. The group then began rolling out public recruitment talks (based on Roger’s lecture) all over the country, as well as approaching existing NGOs to help publicise the rebellion. After a couple of frustrating meetings at senior level with Greenpeace, a group of around 25 XR rebels occupied the UK Office to demand their support. Training sessions began across the UK too, and Real Media went along to a weekend of workshops in London and interviewed some of the people who attended, to find out what was motivating ordinary people to consider non-violent civil disobedience and direct climate action. At the same time as XR were preparing for their public launch, Swedish schools were returning for their autumn term after a summer of unprecedented drought and fierce widespread wildfires that required firefighting intervention from across Europe to get under control. 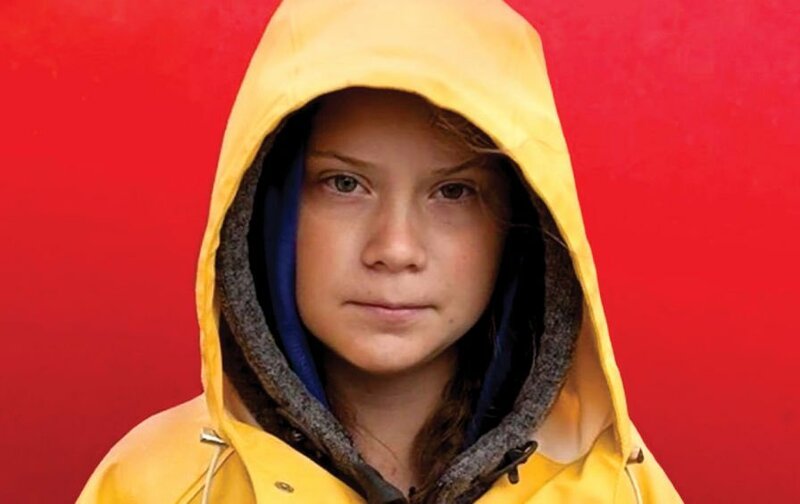 Frightened for her future, and sickened by lack of leadership from politicians, a 15 year-old girl, Greta Thunberg, began skipping school every Friday to sit outside parliament with her #KlimatStrejk banner, spawning a movement of young people across the world which has grown at the same time as the Rebellion. 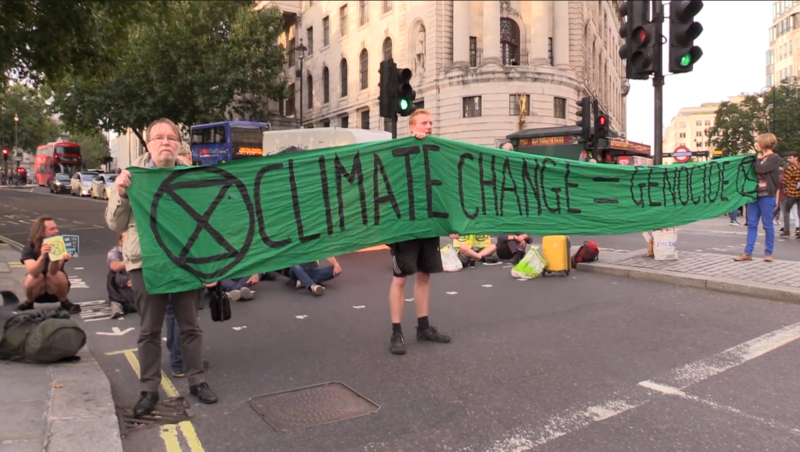 On October 31st, Extinction Rebellion launched their Declaration of Rebellion in an unauthorised event attracting more than a thousand people in Parliament Square, which spilled out onto the road infront of the Palace of Westminster and halted traffic for several hours. Guest of honour was Greta Thunberg, who had travelled all the way from Sweden in an electric vehicle. Among many other speakers was Labour MP Clive Lewis, who reminded the crowd the problem wasn’t just climate change, but bio-diversity, nitrogen, and our water. He also publicly backed the need for civil disobedience but hoped he could ‘change the law’ so that people wouldn’t need to ‘break the law’. Police eventually cleared the road and made several arrests for Obstruction of the Highway, but we believe all those arrested later had their charges dropped. At that first Declaration event on 31st October, among the many inspiring speakers was a 20 year old London-born young woman, Lizia, who gave a passionate indictment against the current neo-liberal system and calling for the real changes necessary to give young people a future. Lizia also delivered a fantastic response a couple of weeks later at an Extinction Rebellion press briefing prior to a week of non-violent civil disobedience actions planned for November. The BBC’s environmental analyst, Roger Harrabin, asked whether XR were setting themselves up to fail by making apparently impossible demands. She gave the journalists in the room a shocking reality check by asking them how she was supposed to react to questions which apparently condemned her generation to a dystopian future because “it’s too difficult” to change. The press conference announced a week of acts of civil disobedience, and the first of these was an attempt on November 12th to shut down the Office of Business, Enterprise and Industrial Strategy in Victoria Street. A large crowd arrived at the main entrance of the building but failed to gain entry after being met swiftly by security, but some used glue to attach themselves to the entrance doors. Meanwhile at the staff entrance, Real Media filmed a small group that went in and calmly glued themselves to the electronic gates, while others chalk-sprayed the windows and lobby with slogans and Extinction Symbols. 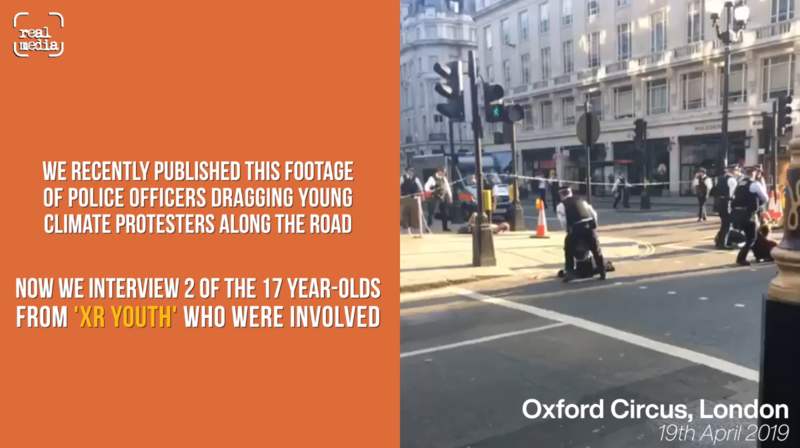 Having heard from the young generation the previous week, we featured two older voices involved in this action, both of whom were arrested that day on suspicion of criminal damage. First, Reggie, in the week of his 85th birthday, peacefully graffitiing windows while police look on from outside. Then we speak with Phil who, arm-locked to others across the doorway, explains how his role as a grandfather and his Christian beliefs have informed his radical action. We also spoke to some of the younger people who actually super-glued their hands to the staff entrance barriers. We wanted to find out what motivated them and what they hoped their actions would achieve. The BEIS action started a week of events, including this banner drop at Westminster Bridge. The week culminated in the largest act of peaceful civil disobedience seen in the country for decades, when thousands of XR supporters took control of five London bridges for much of the day on Saturday 17th November. Here’s our short film of some speeches from Blackfriar’s bridge. Some of the blockades stopped in the early afternoon to move to Westminster Bridge where everyone was gathering later, but on Lambeth Bridge, the blockade continued and there were dozens of arrests, while on Blackfriars Bridge, some members of the Christian Climate Action group had locked on together across the road, extending the blockade to more than five hours, and resulting in several arrests. We filmed their action and spoke to them about their actions. Later the next week, small groups of activists began a campaign of ‘swarming’ roadblocks around London which caused gridlock, in many areas. The technique, designed to disrupt normal function of business and impinge on people’s consciousness, was honed during the air pollution protests of the ‘Stop Killing Londoners‘ campaign. At a set of traffic lights, protesters take the road safely when the lights turn red, and then stay there for up to 7 minutes. Outreach volunteers go and speak with drivers near the front of any queue, explaining why the action is happening, reassuring them that it will only be a few minutes, and offering a cookie and a leaflet. The police were informed about the approximate location of blocks, but often groups would move around from junction to junction. Although there was risk of arrest, and volunteers were aware of this, that risk was minimised by the short/reasonable length of each individual action. We followed one group at the Elephant & Castle early on Weds 21st Novemeber. After two more days of ‘swarming’, Saturday 24th November saw another large mobilisation – a sombre ritualistic protest which began in Parliament Square, sealed off from all traffic by protesters blocking roads and locking-on to each other at each access point. At the centre of a large crowd on the grass was a PA system and a full-size model coffin ‘for our future’. Speakers there included the UN Representative for Island States Farhana Yamin, Kofi Maluwi Klu from the Pan-Afrikan Reparations Coalition, and Rabbi Jeffrey. An attempt to dig a hole for the coffin was thwarted by police – two people were arrested for criminal damage. They have recently been tried and found guilty, receiving conditional discharges and minimal fines. The procession then headed up Whitehall, where several more people were arrested for chalk-spraying Extinction Symbols on the road. Led by a New Orleans style funeral band, around a thousand people followed the coffin along The Mall where it was laid to rest at the gates of Buckingham Palace – a letter to the Queen was read out while individuals adorned the coffin with memories of mankind, nature, and the planet. One woman glued herself onto railings next to the palace gates. Extinction Rebellion organisers never ask police for ‘permission’ but have a very open policy of communication with the Metropolitan Police which has received criticism from some quarters. Real Media staff have covered protests over many years, and we are aware that the police are normally extremely sensitive about any approach to the Palace, deploying riot police on many such occasions. We were struck by the minimal official interference, and we even heard one Sergeant following a small group back to Parliament Square say “Thank you for your voice”. Decisions about policing rebellion will of course come from very high up as the challenges to authority grow, and we’re in no doubt that there will be some return to repression down the line, but there does seem to be an understanding and a respect on an individual basis, that feels different, novel, and welcome. Only time will tell whether this novelty is sustained. After the funeral event, Extinction Rebellion planned to spend some time resting and restructuring, listening to feedback and criticism, and making connections in countries around the world as part of plans for an International Rebellion in the Spring. But meanwhile, another movement was growing. Greta Thunberg was making waves and inspiring school children to join her in #FridaysForFuture protests in many countries across the world. And as part of that, in the UK, Real Media were at the very first school strike, a dozen pupils with banners on a cold and wet November Friday chanting outside Downing Street for an hour or so. 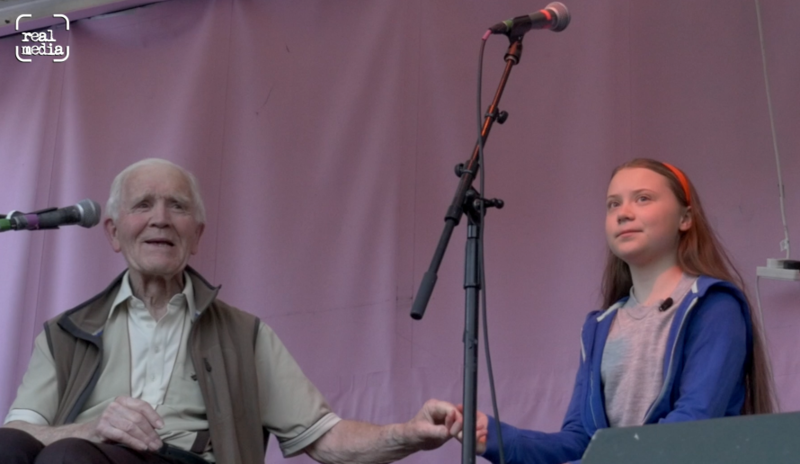 This was not officially an Extinction Rebellion action, and the School Strike campaign remains autonomously led by young voices, but there is inevitably much crossover and collaboration. Greta also made history with her speech to the COP24 Climate talks in which she told leaders “You are not mature enough to tell it like it is – even that burden you leave to us children” and “If solutions within this system are so impossible to find, maybe we should change the system itself”. In December, Extinction Rebellion organised a day of protests at BBC sites across the UK. In London, the headquarters at Portland Place was in total security lockdown for the whole day. Long queues of staff, journalists, guests and technicians waited to get past a single security checkpoint which at times allowed no-one in or out. And outside and around the building were noise protests, music, performances and speeches. Among the speakers was Jon Fuller, a green campaigner and media analyst who has been calling out the BBC’s lack of coverage of climate and ecological news. Despite the disruption, along with protests at every major BBC Centre across the UK, the BBC news chose not to cover the protests. Extinction Rebellion have publicised three demands in relation to their campaign. But what is a Citizen’s Assembly, and how does it work? We spoke to Keith Garrett of the Sortition Foundation to discuss the history of assemblies and to find out what ‘sortition’ – a method for choosing who sits on an assembly, might work. Up to the end of the year, there had been around 150 people arrested during the course of various Rebellion actions in London, and although many have had their charges dropped, others have begun facing court. So we interviewed Jojo Mehta, an activist working with internaional barrister Polly Higgins on two interlinked projects. Polly is helping island nation states to amend international law so that it includes a crime of ‘ecocide’ alongside more well-known crimes against humanity such as the ‘crime of genocide’. To help fund those states in their task, she has set up an Earth Protectors Trust Fund to which anyone can donate, thereby becoming a legally-recognised ‘Conscientious Protector’. Jojo explains in this interview how the protector status can then be used in UK court cases to introduce evidence of climate change and ecological devastation when pleading a defence of ‘right to conscience’. Check out the full interview below for more on this. We also recorded her 2-hour workshop for activists intending to take part in civil disobedience and risk arrest. The next month or so saw a time of reflection for the movement – working groups listened to feedback and criticism, restructured and reorganised, and pushed hard for recruitment (with local talks happening all round the country, plus much outreach across the globe). One method to reach people is by holding a street party – an opportunity to provoke reaction and introduce the public to some low-key civil disobedience and disruption, while engaging with people through speeches, music, art, food, leafletting and general conversation. We filmed at such an event in early February when activists closed down the major Kingsland High Road for the afternoon near the busy Ridley Road market. Thousands of students walked out of schools and rallied in towns and cities across the country, some with school permission, many without. In London there was supposed to be a static protest in Parliament Square, but the area was overflowing with students on an unseasonably hot February day, and most couldn’t hear the speeches coming from a small sound system, so an impromptu and chaotic march began, first up to Downing Street, then splitting in various directions, bringing the area to a standstill with sit-down protests and roving processions. Police were caught out by the numbers attending and despite using horses to intimidate children sitting in roads, they struggled to gain any control, and even a handful of arrests failed to quell the determinatiion of young people to protest. Their anger at government inaction and the failure of adults to protect the planet was sincere and palpable, but there was also a good-natured joy in the acts of defiance, and a dignified committment to non-violence. Real Media covered the day, and also published a powerful speech by George Bond of the Student Climate Network. A week on, and teachers and parents showed some solidarity by calling a ‘Teach The Truth’ protest at the Department of Education. At the rally, various academics berated the education department for its lack of leadership over the emergency, and its poor coverage of climate and ecological issues within the school curriculum. A class of primary school age children sat in cardboard seats listening as young people were invited to speak on an open mic. A south London teacher, Tim Jones, chalk-sprayed the building with the ‘Teach The Truth’ slogan, and the road was also decorated with art and slogans. Despite quite a large police presence and a high-level of surveillance, no arrests were made at the scene. On March 9th, Whitehall was the scene for another ritualistic action, featuring hundreds of litres of gooey fake blood (made from bio-degradable ingredients) carried silently by dozens of activists and poured on the street outside Downing Street. Mainstream media were there in numbers, and the spectacle got some press and TV coverage, but the expectation of multiple arrests was dampened by police reluctance to intervene. The ‘Blood Of Our Children’ spill was then followed by a series of speeches by young people. We were struck by this powerful speech by 14 year-old Felix. UK students were back out on the streets again on March 15th at the same time as hundreds of similar events in cities around the world. Numbers were even larger than April, with many thousands in London alone. What is refreshing and exciting about these youths is that they display such a sense of empowerment. They are utterly defiant of authority, but without malice or violence. They see adults, and especially the state and its agents ie the police, as having lost all authority through their failure to address ecological issues. They’re not interested in a fight, but they won’t take orders. They want to build a different world. The energy and righteous enthusiasm is palpable as shown by some of their inspiring and eloquent speeches. Thousands disrupted the trooping of the colour after an impromptu march up The Mall to Buckingham Palace, and then they later took over Westminster Bridge for speeches and a party. There, several gave themselves up for arrest after continuing to obstruct the road despite police warnings. As the Rebellion movement has grown exponentially, and leading up to the International Rebellion on 15th April, the decentralised ‘holacratic’ structure means that there are lots of semi-autonomic groups springing up with their own functions within the movement. Internally, it’s a balancing act between growing as fast as possible, against not ascending into chaos. The apparent sudden presence of such a large organisation has surprised seasoned activists, some of whom view it with deep distrust. Similarly, the movement’s rapid emergence and its huge mobilisations have shaken up long-established NGOs, who are undoubtedly threatened by this rather massive new kid on the block. The publicity around “getting people arrested” has raised concerns about consent and welfare too. We recently interviewed two of the co-founders, Gail Bradbrook, and Roger Hallam, about some of these issues. One of the keys to the rapid expansion and recruitment of the rebellion is the system of local groups self-organising, and we filmed a local north London group set up a family day with a synbolic element of civil disruption and disruption. A dozen or so people, each brought different elements and abilities to organise the day, and by the end of it they had way more than a hundred new sign-ups, some of whom said they were willing to be arrested in peaceful actions. This model has been happening every weekend in towns and cities up and down the country. The International Rebellion begins on 15th April in London and at hundreds of sites across the world. The movement has always been deeply committed to non-violence and there is both a tactical and a spiritual dimension to this commitment. We interviewed Skeena Finebaum-Rathor, a local councillor from Stroud, who works with the ‘Visioning Group’ within the organisation. She talks about the ‘heart-intelligence’ that informs many of their actions, and speaks about the work of Professor Jem Bendell and his calls for ‘deep adaptation’ to help us all find a way through the impending ecological crisis. We’ll be back after this first International Rebellion with a round-up of news, and meanwhile will be covering some of the action in London.